Investing in a mobility aid such as a mobility scooter is often one of the first steps people take when preparing to age in their own home. Mobility scooters allow seniors to enjoy the freedom and independence of leaving the house on their own accord and complete daily tasks such as doing the groceries, paying the bills, and much more. However, choosing the correct mobility scooter is not such a simple task. The market is flooded with a variety of makes and models, each of which have different features to cater for different needs. In this article, I’ll discuss some of the biggest factors that influence a buyer’s decision when choosing a mobility scooter either for personal use, for a loved one, or for a patient, and I’ll also take a brief look at two of the most popular models. The most common mobility scooters on the market currently have either three or four wheels. Both three-wheeled and four-wheeled models come with their own benefits, and choosing between the two is highly dependent on the individual’s needs. The general consensus is that three-wheeled mobility scooters offer greater maneuverability compared to their four-wheeled counterparts. 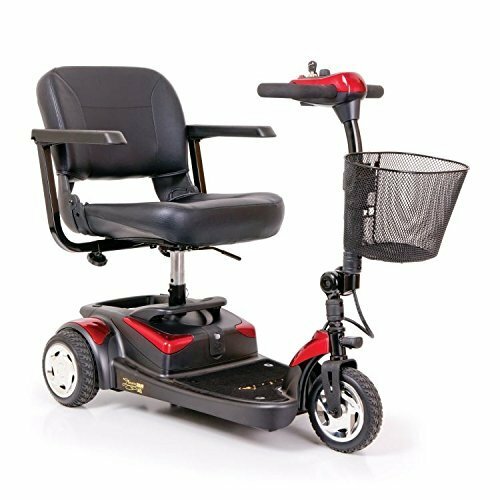 They also tend to be lighter and more spacious due to the fact that they only have one wheel positioned in front of the user, making them a great solution for people who are tall, prone to leg stiffness, or suffer from aching legs. Three-wheeled mobility scooters also feature a tighter turning radius, making them ideal for use indoors or in tight spaces. They can also be used in light outdoor conditions, and most three-wheeled scooter models will come with headlights, tail lights, and turn signals for safe use on roads and sidewalks. 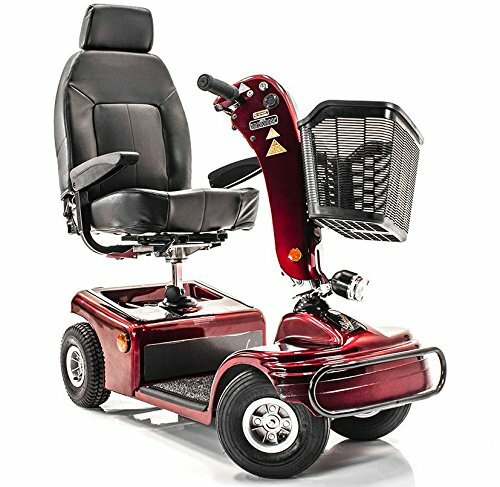 However, if you, your loved one, or your patient are looking for a scooter that can be used predominantly outside, then a four-wheeled model may be the best way to go. Four-wheeled mobility scooters are more stable than three-wheeled models, simply due to the fact that they are evenly balanced at the back and front end of the scooter. They also tend to be more rugged and durable, and have more power and reach higher speeds than three-wheeled models, but they are generally not as maneuverable. Four-wheeled mobility scooters are better suited for outdoor use because they are more stable and can be used on a variety of terrains, and also come equipped with the necessary road safety features such as headlights, tail lights, and turn signals. Compact mobility scooters are super lightweight and are great for users who require a scooter that can be transported easily. Most compact models can be folded without the need for extra tools, and can easily be lifted onto a bus, car, or other mode of transport. As they tend to only come in three-wheeled models, compact mobility scooters have a tight turning radius, but are not rugged enough to handle curbs or rough terrain, meaning they are not really suited to be used outdoors. They also tend to have smaller batteries, meaning they will have a shorter travel range and less power than mid-size or full-size scooters. Compact scooters are perfectly suited for travel, and for use in apartments, condos, houses, or any other indoor environment that features tight spaces. Mid-size scooters are generally available in both three and four-wheeled models, and are still smaller than full-size scooters, making them a great choice for all-round use. Unlike compact scooters, they CANNOT be folded, but they are still light enough to be lifted into a minivan, SUV, or truck. Mid-size scooters are not as maneuverable as compact scooters and are not ideal for use in an apartment or condo. However, they still have a small enough turning radius to be used in shopping malls, grocery stores, etc. They are also rugged enough for light outdoor use, and can tackle small curbs and slightly rugged terrain. As they are larger than compact models, mid-size mobility scooters also tend to have larger batteries, meaning they have a larger travel range. While the weight capacity of mid-size scooters varies, they tend to peak at about 250lbs. Full-size mobility scooters tend to reach the highest speeds and travel the largest distances on a single charge. They also support more weight, and bigger motors and tires mean that these scooters can be used on rough terrain. Due to their size, they are not suited for indoor use, and they also lack the maneuverability to be used in areas that have tight corners or spaces. They may not fit into some SUVs or minivans, and tend to be very heavy. 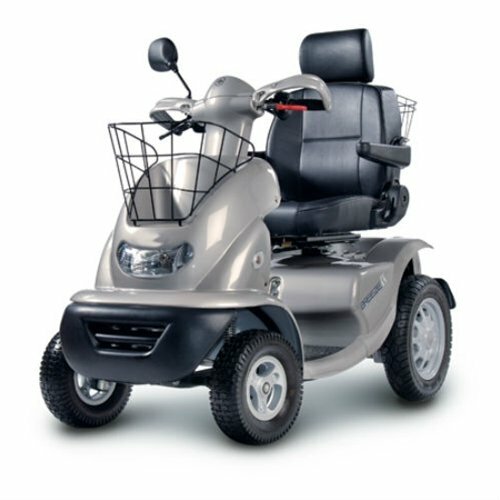 However, they are perfect for outside use in parks and acreages, and for patients who want the freedom to make long trips and do not require a scooter to move around once they’ve reached their destination. 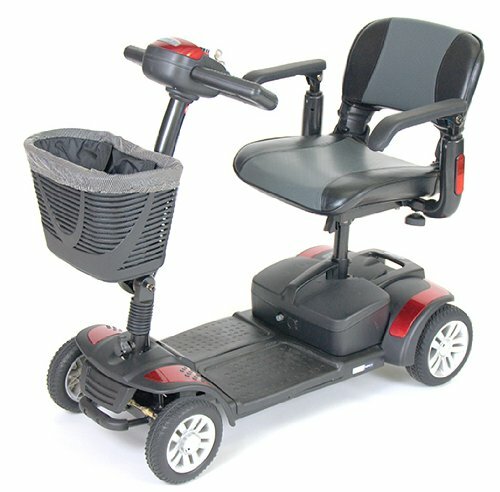 Do I need a scooter to move around my home or small areas like shops and malls, or do I need it to make longer trips to the supermarket, to visit friends/family, etc? Do I need a scooter that can be easily transported in a car, van, SUV, or even public transport? Do I plan to use the scooter indoors or outdoors? Will I need a scooter that has enough power to go uphill? What kind of equipment will I need to take with me when I use my scooter? 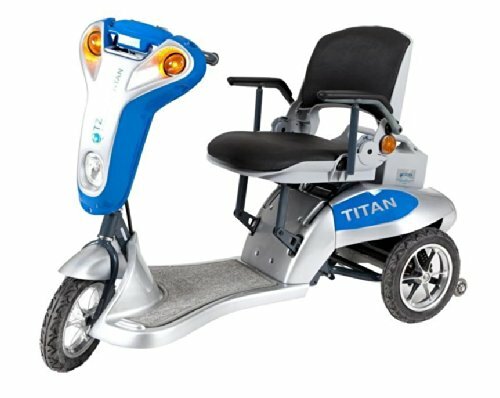 The Tzora Titan 3 Wheel Mobility Scooter impressed me with its folding capabilities, because using a device that can be easily stored and transported is fundamental when it comes to achieving the highest comfort. The Tzora Titan 3 Wheel Mobility Scooter, a product with a great portability that is recommended for people who want to attend local events, but also for those who like to travel by plane. Using this unit will help you continue to do the activities that you like, as it is great for indoor and outdoor use, and it comes with an entire list of reliable features. Besides sporting a sleek and modern appearance, the Tzora Titan 3 Wheel features a lightweight design, ensuring easy maneuverability, and allowing it to be transferred easily into a car, a train or an airplane. The Tzora Titan 3 Wheel Mobility Scooter sets itself apart from other important brands with its incredibly comfortable features. Given that it incorporates a Memory Foam seat that is 22″ wide, you don’t have to worry about experiencing discomfort. The unit’s engineering features a four point seat structure, which ensures a better stability than a unit that comes with a center seat post. Due to its center of gravity, a center seat post can easily become unsafe on inclines, and the unit can become quickly unstable, so the Tzora Titan’s four-point design improves stability on inclines by 45%. This unit comes with extra safety features, as it integrates a full light package: left and right turn signals, front headlight and running lights, rear tail lights and reverse tail lights. This 3-wheel scooter has large rear tires, which means that it ensures excellent traction and smooth rides, even when it is used on an uneven surface with hills or ramps. The weight capacity featured by the Tzora Titan 3 Wheel Mobility Scooter is 300 lbs, while the scooter’s overall weight is 141 lbs. This ultra lightweight product measures 55″ Length x 24″ Width x 38″ Height, and it integrates a 39″ turning radius. It runs on 12V – 26Ah batteries, and it can range up to 19 miles. The battery light indicator will keep you informed about the battery life, making it easier for you to monitor your device and ensure that it won’t run out of power when you most need it. The maximum speed offered by the Tzora Titan is 8 mph, so comparing with similar products that you can find on the market, this unit will not allow you to lose any time on the road, as its main goal is to help you enjoy life without wasting any minute. Given that it comes with a folding frame and a folding delta tiller, the Tzora Titan 3 Wheel Mobility Scooter features a great portability, especially since its heaviest component weighs just 49 lbs. It can fit in any car’s trunk, and it can be transported from one place to another easily. Its batteries packs, which are located in the back section, can be simply removed by lifting them up, as there are no cables or wires for you to disconnect, because the terminals connect automatically, so you won’t be required to make special adjustments. Very maneuverable, the Tzora Titan enables you to maintain an active and spontaneous life, as it can be disassembled and folded in just a few minutes, without involving any physical efforts. This unit can separate into multiple pieces that can be easily stored, so no matter how small your place is, you can be sure that you can keep this unit out of your sight when not in use. The Tzora Titan 3 Wheel Mobility Scooter is listed at Amazon here. It comes with a 16 months manufacturer’s warranty. If you want to maintain your scooter in the best conditions, you have to use a tarp when keeping it outdoors, which will prevent moisture and particulate matter from getting into the internal mechanics. A surprising demise of the two batteries can be more than inconvenient, as it can leave the user in a really precarious situation. So, to prevent this type of problem, and you must make sure that you protect the batteries from extreme temperatures, and you must avoid overcharging them, as that might cause them serious damage. The Buzzaround brand is well known for producing efficient and durable mobility scooters. The BuzzAround Lite 3 Wheel Mobility Scooter is one of their latest models. Unlike its predecessors, the Lite model features numerous improvements which allow you to dissemble it for easy storage, to remove its battery for a comfortable recharge and much more. Furthermore, this scooter has the highest torque of any scooter in its category. However, it lacks some sophisticated convenience features and its range its pretty week. Nevertheless, lets take a closer look at it and see if it can turn out to be a value purchase for anyone. Most mobility scooters are very easy to drive on a clear lane but have difficulties going uphill or handling themselves on problematic terrain. However, this is not the case of the BuzzAround Lite 3 Wheel Mobility Scooter which can easily climb inclined areas and can comfortably take turns even on grass of gravel. The scooter can be used both indoors and outdoors. Its compact 3-wheel design allows the user to drive the scooter even through narrow spaces. For the user’s convenience, the scooter also features an average sized front basket which can be used for carrying traveling necessities such as a purse, a bottle of water and much more. As far as comfort goes, this scooter features an improved, more comfortable seat with upgraded armrests which can be flipped-up for easy transfer. The scooter also features an auto grade carpet on the floor and a modern finish. The overall body has a combination of Vermillion red, Sahara arctic blue shades. The black seat is 15″ wide and 14″ deep. This scooter comes with an off-board battery charger, quick release batteries, an electronic speed control and a programmable controller. The scooter has a 250 pounds maximum weight capacity and a 4 mph maximum speed. It is powered by a Sealed Transaxle, motor 24 VDC and features a rear-wheel drive. The main problem with this scooter is the fact that it only has an 8 mile range. In all fairness, there are a few scooters on the market, such as the Pheonix HD 4 Wheels Mobility Scooter, which can range up to 15 miles with a single battery. Furthermore, the Pheonix HD 4 Wheels Mobility Scooter also allows the user’s to add a second battery which allows the scooter’s range to reach 30 miles. The Pheonix HD is also in the same price range as BuzzAround Lite 3 Wheel Mobility Scooter. This being said, I am not impressed with the Lite scooter’s 8 mile range. Mobility scooters are designed in order to help people with mobility problems be independent. However, most scooters can be very challenging for this type of people. Since you can’t actually use them for large distances, you need to store them in your car truck until you reach your destination. Most of them are very inflexible and can only fit in large trunks. However, the BuzzAround Lite 3 Wheel Mobility Scooter can easily be dissembled in order to fit in any car. The dissemble process is very simple. All you have to do is pop off the seat, pull of the battery and take the frame apart. In these three simple steps, you will dissemble the scooter in 5 lightweight pieces that can easily be carried even by elderly people. The heaviest part weights only 32 pounds. For optimal safety, this scooter is equipped with electro-mechanical brakes and 8″ Foam filled non-pneumatic tires. Despite having an unsatisfactory range, I have to admire this scooter for its excellent maneuvering capacity. It features a 31″ turning radius, a 62.75″ pivot turn, a 39″ three point turn and a 28″ corridor turn. Its 2″ ground clearances offers it a very good stability. In order to be as safe to use as possible, the scooter also comes with a control panel which allows the user to handle back-lighting, a good speed gauge which offers throttling control and a horn. The price of the BuzzAround Lite 3 Wheel Mobility Scooter is $849. The scooter’s price includes the batteries and a the charger. As a product made in the U.S.A, the Lite scooter abides by high levels of quality and durability. It also comes with a One Year In-Home Service Contract warranty. The electronic parts are covered by a 2 year warranty and the frame is covered for a lifetime. Furthermore, most of its distributors offer free shipping on this scooter. The Shoprider Sunrunner 4 Wheel Mobility Scooter comes equipped with many features and facilities. However, it integrates a turning radius that won’t allow you to make tight turns, and it can’t be broken into pieces for easy transporting. The Shoprider Sunrunner 4 Wheel Mobility Scooter is a powerful device that can help disabled people become more active and independent. It is recommended for both indoor and outdoor use, and it ensures comfortable rides that will get users as far as they have to go. According to many customers reviews, this machine has a sturdy construction, which ensures great durability, and it also has a long range for delivering the best support and assistance. 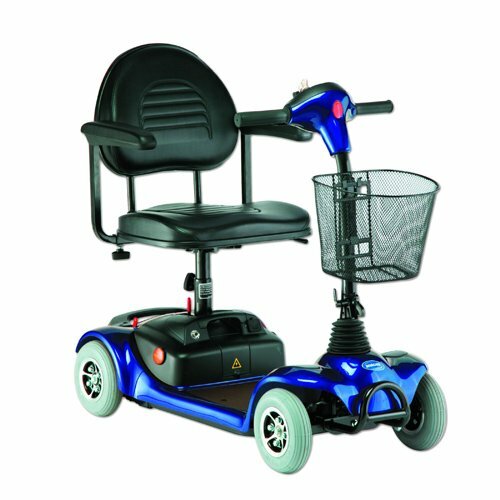 When it comes to purchasing a reliable mobility scooter, it is important to consider the comfort that it can offer you. Giving that you are going to spend a considerable amount of time in your scooter, you must opt for a seat that can eliminate pressure and offer sufficient support for your back. The Shoprider Sunrunner 4 Wheel Mobility Scooter incorporates a deluxe padded chair that can slide and swivel for getting off and on the scooter easier. It also allows you to adjust the height to provide enough room for your knees, and the best part is that it comes with a high ground clearance. At 3 inches, it can easily be used on uneven sidewalks and surfaces, and it enables you to travel across non-paved terrains without worrying about unseen obstacles, or damaging the unit’s motor. Furthermore, the tiller and the flip-back armrests can be adjusted to our personal preference. This scooter comes with a spacious basket for meeting all your storage needs, and it has many safety features that can help you avoid dangers and unpleasant situations. Therefore, a headlight and a rear view mirror are included to improve your visibility. The Shoprider Sunrunner is a motorized scooter that has a 300 pounds weight capacity, and a 5 mph top speed. Although it might not be very fast, it can help you move quick on areas that are meant for walking, so that you won’t waste any time while trying to get to your destination. In other words, you can get across a crosswalk faster than regular people, and you won’t have to worry about not catching the elevator before the doors close. Another benefit that you can obtain by purchasing this device is that it delivers an impressive range, as it can travel 25 miles per charge. Therefore, you will not be exposed to the risk of being stranded every time you take your scooter outdoors, but you will be able to relax and enjoy your rides instead. The 50 inches turning radius and the four-wheel design prevents the scooter from making tight turns, which might block out your options, however, its construction provides more stability than devices that can make quick turns, and its 10-inch pneumatic wheels can deliver the smoothest rides. 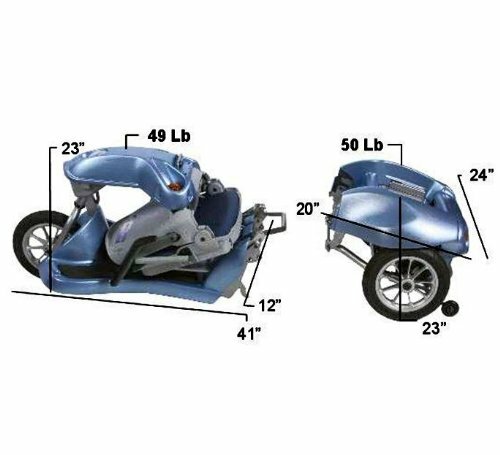 Furthermore, the 22-inch base width helps you get your scooter easier into small indoor spaces. The Shoprider Sunrunner 4 Wheel Mobility Scooter can deal with inclines very easily. Unlike units that can travel up only a 6-degree slope, this machine can climb an 8-degree grade. Although it might seem like a small difference, it allows you to have access in places where you couldn’t get before. Considering its compact folding seat, you can store your scooter quite easily. 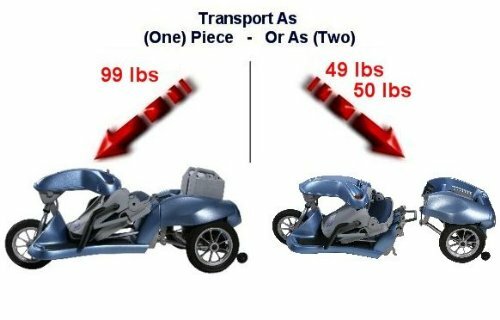 This product measures 49 x 22 x 38 inches, and it weighs 180 pounds, but given the fact that it can’t break down into pieces, you will have to remove the middle seats of your car in order to transport it. The Shoprider Sunrunner price can be viewed on Amazon here, and it is backed up by a one-year warranty for the frame, drive train and electronic elements. Furthermore, the company offers a six-month warranty for the battery, which is typical for these type of products. So, you will get enough coverage to convince yourself that you made a good choice. Despite the fact that it comes with a low distance range, the Invacare Lynx L4 4-Wheel Mobility Scooter can surprise you with other effective features. The thing that we liked the most about this unit is that it can be adjusted to anyone’s needs. The Invacare Lynx L4 4-Wheel Mobility Scooter was designed to help individuals suffering from mobility ailments by offering them the chance to travel to their favorite places without needing the assistance of another person. This practical machine can facilitate a customizable and comfortable ride, as it comes with features that increase its overall performance. The fact that its armrests and the seat’s height can be adapted to your needs represents a great bonus. Based on the fact that you will spend a considerable amount of time using it, you should have the possibility to make all the adjustments you need to feel more comfortable when driving. Another convenient feature is that unlike other units which integrate only three wheels, this product comes with 4 wheels, providing more stability and easier control on inclines. However, although it can handle surfaces with humps and bumps easily, the distance from the base to the floor measures only 4.5″, which means that it might encounter problems into going over high obstacles. Still, for those who have difficulties lifting their legs, a low scooter is the best solution for their problem. The manufacturers of the have tried to create a device that provides all the features required to offer a smooth ride. This product can give you the functionality of the L-3 model power scooter with the performance and strong look of a 4-wheel unit. Its 360-degree rotating chair can give a whole different perspective to users with different levels of mobility, while its 300 lbs capacity makes it perfect for individuals of different sizes. Still, comparing this device with other handicap scooters, we can notice that this unit is constrained by a 7 miles range. While most scooters can claim a battery charge of 20 miles, the Invacare Lynx L4 has a low distance range, which can negatively impact your independence. Still, if you plan to use this product only indoors, or if you don’t like long travels, you might find it very effective. If you decide to use it for long driving, you can opt for extra batteries and you can obtain a better range by using an off-board or on-board charging system. The Lynx L4 4-Wheel travels at a maximum speed of 5 miles per hour, so you can be confident that you will reach your destination right on time. It measures 39.8 x 20 x 36 inches, and it weighs 112 lbs, which means that it can be easily maneuvered, and the seat has 18″, so it can fit users of all kind. Its 51″ turning radius and its flat-free wheels ensure a great driving experience, while its 8″ incline capability provides a safe ride. The Lynx L4 4-Wheel is a lightweight product, and can be easily disassembled into 5 pieces, and stored anywhere you want in the house. When you have to transport the unit, you can break it down into elements that can fit in a car, so its design offers you great transporting possibilities that don’t require the use of special scooter lifts or scooter carriers. All you have to do is follow 4 simple steps to disassemble and reassemble the unit, and you are good to go. Although other devices feature a better drive range, it is one of the more affordable mobility scooters (see the price at Amazon here). It is available in blue and red, and it comes with a 1 year warranty on the electronics, frame and trans-axle, meaning that you will have plenty of time to convince yourself that you made a good choice. The Breeze S 4-Wheel Luxury Heavy Duty Scooter comes with a modern, comfortable seating, and it combines a nice design with functionality in a great way. This heavy duty scooter is larger than other units available, with a weight capacity of 350 lbs, but it is also very fast, and allowing you to do all the activities that make you happy without wasting any time or worrying about battery life. The Breeze S 4-Wheel is among the safest devices available, featuring the most advanced safety system in the world. It offers exceptional comfort and easy control and enhanced style. The manufacturer, Afikim Electric Vehicles, has taken every small detail into consideration with the to ensure driver safety and comfort, including state-of-the-art electronic controls, advanced shock absorbers, reinforced chassis and fully adjustable orthopedic seats. Combining the capacity to offer stability for varying terrains with the ability to make tight turns, you will obtain a machine that can facilitate better travel times and more comfortable rides. Ergonomically designed tiller is adjustable to meet the drivers’ exact requirements. Full round suspension and shock absorbers delivering levels of stability never seen before. 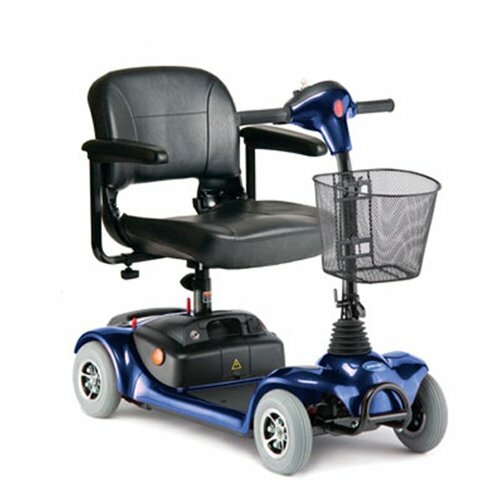 Besides integrating a large suspension system, the Breeze S 4-Wheel includes an incredible 360-degree swiveling chair, which has a 350 lbs weight capacity and a 18″ seat width. Furthermore, the unit’s overall length is 52″, while its overall width is 26″, and it weighs 269 lbs. The 67″ turning radius on the unit impacts its mobility in a great way, but the most impressive thing is that the machine can work at an incredible speed of 9,3 MPH, enabling you to move very fast, especially since it features a 25-mile battery range. Another great advantage that you can get by purchasing this unit is that it comes with an energy-saving option, which is used for turning off the brake light after 5 seconds of idling, preserving the battery. Despite its price tag, you will get an incredible value, which is reflected in its safety properties, power and reliability. You can view the price at Amazon here. The Breeze S 4-Wheel Luxury Heavy Duty Scooter is backed up by a standard 2 years warranty, which means that you will have plenty of time to test its functionality. Whether you’re interested in a unit that offers more safety features or one that offers more stylish, adjustable features, you can’t go wrong with the Spitfire EX 1420 4-Wheel Mobility Scooter. While most people are disappointed with the fact that some units don’t provide enough room for the feet, with the Spitfire EX 1420 4-Wheel you have nothing to worry about, because it offers additional space, allowing taller users to feel comfortable, as well. 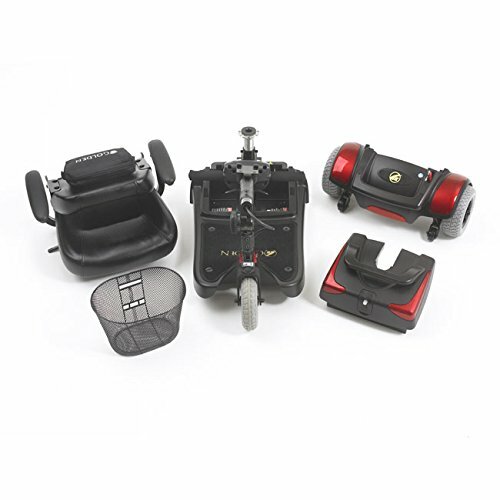 This machine comes with customizable features, as it integrates flip-up padded armrests with reflectors. You can also adjust the angle and height of the armrests, which is a great comfort feature. Due to its practical size, this compact scooter can be used both indoors and outdoors. The Spitfire EX 1420’s sturdy components ensure a great durability, while the 180° swivel seat allows you to obtain superior mobility. Furthermore, with this device, you have the possibility to increase battery millage, as it gives you the chance you to choose between two different types of batteries, enabling you to have a say in the way that your unit operates. So, depending on your preferences, you can opt for the 12AH battery, which offers a distance of 9 miles, or you can use the 21AH battery, which offers a range of 15 miles. Another great advantage that you can get by purchasing this model is that it incorporates an adjustable tiller, allowing you to put the controls right where you want them. With a maximum incline of 12 degrees and a 48” turning radius, you can be confident that you will enjoy a great functionality, which will give you the possibility to do the things that you love the most without needing any assistance. This unit’s overall dimensions are 35” H x 20” W x 40” D, while its seat measures 17” W x 16” D. Furthermore, it has a 300 lbs capacity, and it features a maximum speed of 5 mph. The Spitfire EX 1420 4-Wheel Mobility Scooter can split into five pieces, which makes it easier to be transported from one place to another. Moreover, giving that its heaviest component weighs only 28 lbs, it can be disassembled and put back together in just a few minutes without using any special tools, ensuring easy storage. This lightweight scooter is very simple to maneuver because it can get through any aisle, and its large, front-mounted basket allows riders to go shopping and carry anything they want in the most comfortable conditions. Also, the fact that the chair swivel in any direction is very helpful, so you will get a unique combination of utility and comfort. he Spitfire EX 1420 4-Wheel Mobility Scooter is considered one of the most affordable units on the market, (see the price at Amazon here), but you won’t have to give up any comfort or features for the price. The main structure of the scooter, which is the frame, comes with a lifetime warranty, while the electronic components are backed up by a 14-month warranty. There is also a six month warranty on the batteries. I like how you mentioned that the Invacare Lynx has adjustable armrests and seat height. That sounds nice because then you can maximize your comfort. My dad needs a mobility scooter, so we’ll definitely look for one that has the option to adjust like that one.